"The two most important days in your life is the day you are born and the day you find out why." 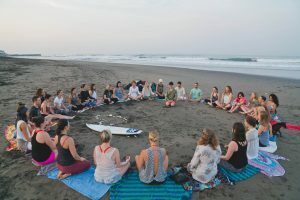 Join a network of teachers around the world who want to share the Blissology Mission of providing experiences that create healthier bodies + minds, thriving communities and deep reverence for nature. Our goal is to create inspirational teachers who are both knowledgeable healers and creative visionaries that inspire authentic human love to blossom in the hearts that they touch. Our commitment is to provide trainings and certification that balance the science and technical side of yoga with intuitive, inspirational and transformational. We want to share this Blissology path and create an upward spiral of love and positivity on this planet. If this mission speaks to you, here is how it works. Can be attained at a Blissology Yoga 100 and 200-Hour Teacher Training. Teachers who have graduated from other 200-hour trainings may take the 100 “Bridge” program at these trainings, plus pass practical + written exams to achieve 200 Graduate status. 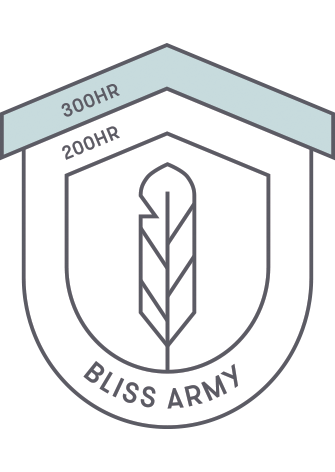 The Blissology 300 and 500-hour Certification is comprised of 6 300/500 hour advanced modules. Each course is either 50 or 75 hours long. You can take these courses in any order. 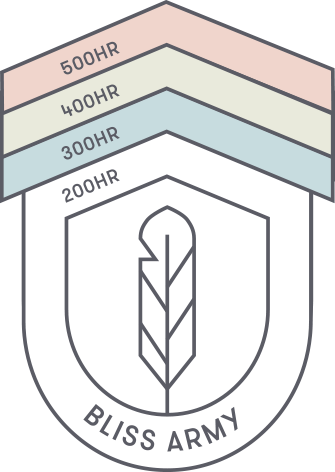 After completing 2 modules, you will be certified at the 300 hour level. 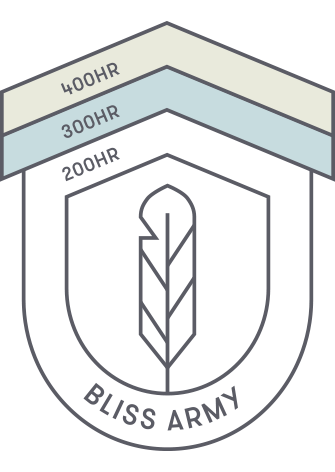 After completing 3 modules, you will be certified at the 400 hour level. After completing 2 modules, you will be certified at the 500 hour level. 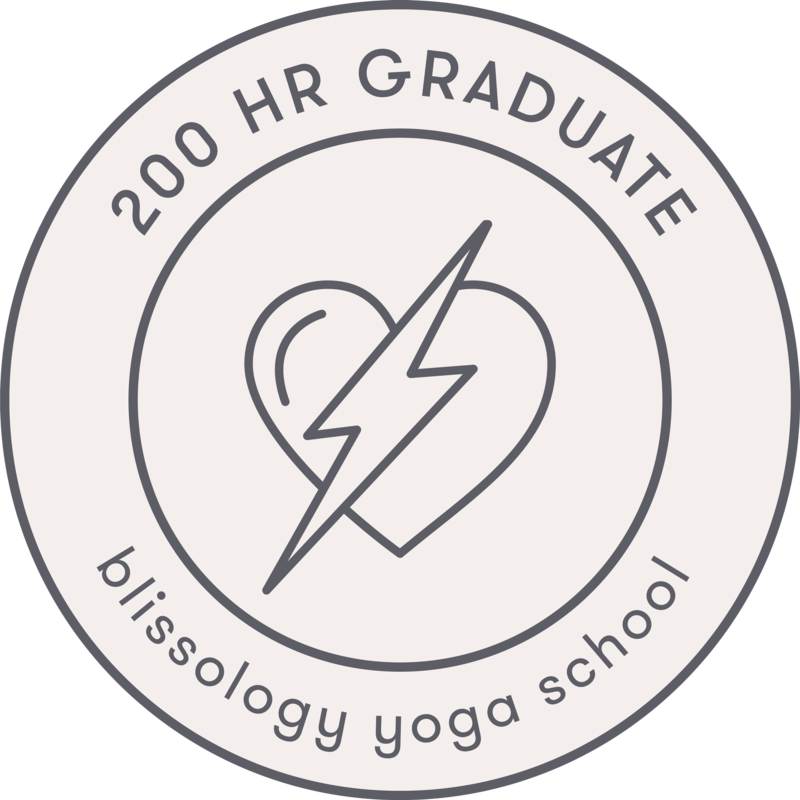 The Blissology 400 hour Certified Accreditation is for teachers who have completed their Blissology 200 hour Certification plus 4 Advanced 300/500 hour modules. They will receive a yellow, 4 star chevron and their Bliss Army teacher profile will be updated. Blissology 400 hour Certified Approved Teachers who have completed the Advanced Alignment + Adjustments Module plus attended an "Yoga Foundations" Course will be able to teach this Blissology Signature Course (coming 2018). 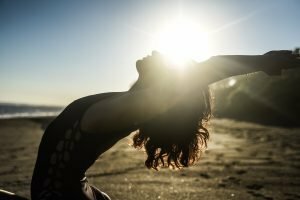 The Blissology 500-hour Certified Accreditation is for teachers who have completed all six modules including assisting on a Blissology Yoga 200 hour Teacher Training. They will receive a pink, 5 star chevron and their profile on the "Find a Yoga Teacher" page will be updated. Blissology 500 hours who have submitted a video of their classes for approval and who have attended an "Align Your Yoga, Align Your Life" Signature Course will have the ability to teach the "Align Your Yoga, Align Your Life" (Coming in 2018). 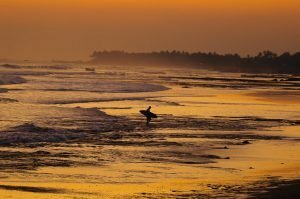 This Immersion covers key alignment principles and philosophy of the yoga lifestyle. 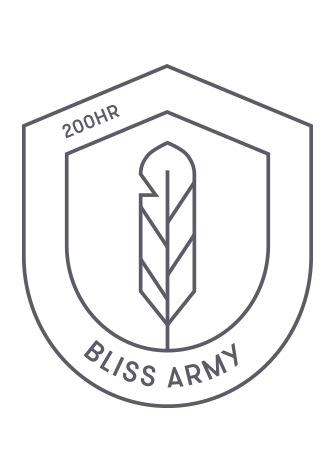 Additionally, they can apply to become a paid lead assistant at a Blissology Yoga 200 hour Teacher Training and can apply to use Bliss Army logo as their credential.